Atlantyca Entertainment’s stage production Geronimo Stilton: Mouse in Space is launching a tour in Ontario, Canada. The Ontario tour will begin in October 2018, premiering at the Richmond Hill Centre for the Performing Arts. In Geronimo Stilton: Mouse in Space, villains are threatening New Mouse City, and the only hope is Geronimo Stilton. The hero is launched into space on a top-secret mission to save the day. 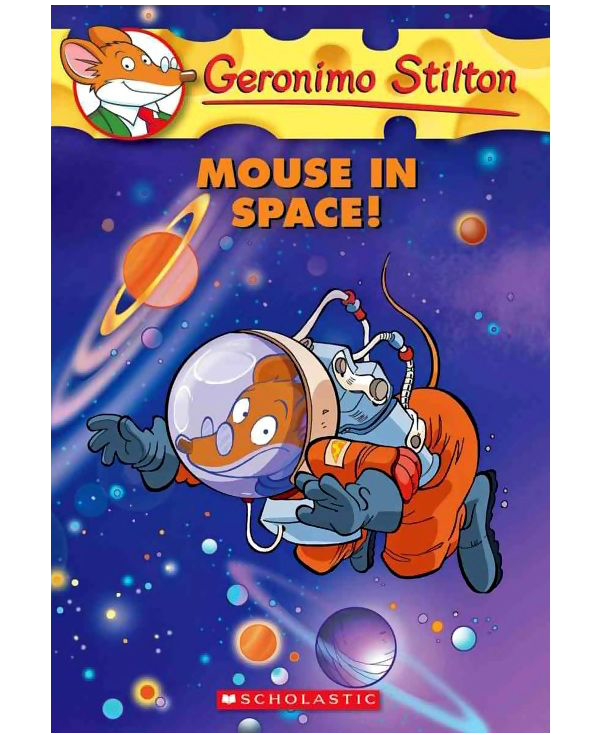 Geronimo Stilton: Mouse in Space is based on the bestselling Italian book series by Elisabetta Dami and is adapted for the stage by John Maclay. The deal was secured by Atlantyca Live and brokered by the Gurman Agency, Atlantyca’s theatrical literary agent. Atlantyca’s first U.S. stage show launched in January 2016 with the premiere of The Oregon Children’s Theater’s Geronimo Stilton: Mouse in Space. Katy Carkuff stars in “The Freshest Snow Whyte,” a futuristic, hip-hop update to the famous fairy tale. Imagination Stage was so pleased with its hip-hop trilogy — “Zomo the Rabbit: A Hip-Hop Creation Myth,” 2009; “P. Nokio: A Hip-Hop Musical,” 2012; and “Cinderella: The Remix,” 2014 — that it has commissioned the same team again. Playwright Psalmayene 24 and composer Nick “tha 1da” Hernandez will soon unveil The Freshest Snow Whyte, the first of a five-play series about science, technology, engineering, art and math. “ ‘The Freshest Snow Whyte’ is my exploration of technology through the lens of hip-hop,” Morrison says. The heroine of the title, a brilliant graffiti artist played by Katy Carkuff, lives in the year 3000. Instead of spray cans, she uses a graffiti device that she programs and then “sprays” onto walls (with the help of designer Tewodross Melchishua’s projections). Replacing the evil stepmother is a jealous uncle named Kanye East (Calvin McCullough). A longtime graffiti star himself, he goes a little crazy when he hears that Snow Whyte is now considered the best graffiti artist in the land. His servant, 3 Pac (Frank Britton), and magic mirror, Mira (Jonathan Feuer), can’t reassure him. So he spirits his niece to a backwater planet where they still use spray cans and her work won’t be seen. Of course Snow Whyte triumphs. Read the full article fro the Washington Post here. Ms. Frizzle is back — sort of! PEOPLE can exclusively reveal that Saturday Night Live‘s Kate McKinnon will be starring in Netflix’s revival of The Magic School Bus: Rides Again as the voice of teacher Fiona. Fiona, who is the sister to the the original Ms. Valerie Frizzle, will bring the same comedy mayhem and science education as the original educational ’90s series. Frizzle. The TV series — which premiered on Sept.10, 1994, is based on the book series of the same name by Joanna Cole and Bruce Degen. Gurman Agency LLC currently represents the stage rights which will be adapted by Children’s Theatre Company (Minneapolis) and Chicago Children’s Theatre (Chicago). Ernie Nolan, an award-winning director and playwright based in Chicago, has been named as the new artistic director of Nashville Children’s Theatre, beginning February 1, 2017. Nolan succeeds Scot Copeland, NCT Producing Artistic Director for 31 years, who died unexpectedly in February of this year. 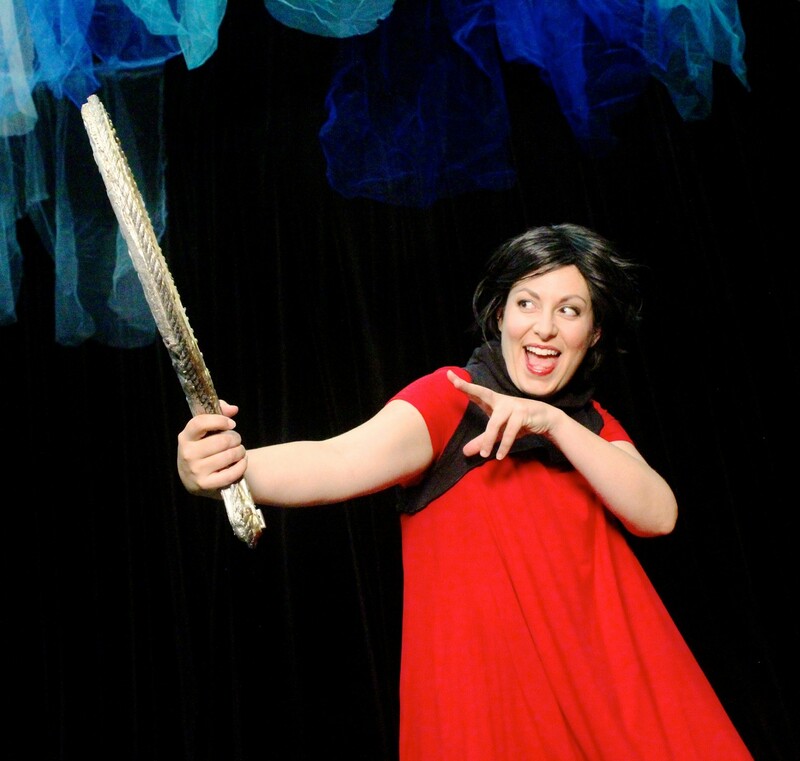 Nolan, in 2014, was the recipient of the Illinois Theatre Association’s Award for Excellence in Theatre for Young Audiences. As former Artistic Director of Emerald City Theatre, he helped create The Little Theatre, the nation’s first performance space dedicated exclusively to interactive and immersive theatrical experiences for early theatre goers ages five and under. Nolan’s work as a playwright has been featured both nationally and internationally. He has adapted and directed such storybook favorites as If You Give a Cat a Cupcake, If You Take a Mouse to School, Mo Willems’ Don’t Let the Pigeon Drive the Bus! and The Adventures of Doctor Dolittle. His work at The Broadway Playhouse includes A Charlie Brown Christmas, Fancy Nancy The Musical, Pinkalicious, The Cat in the Hat, Cinderella, Charlotte’s Web, and the world premiere of Hansel and Gretel: A Wickedly Delicious Musical Treat, written in collaboration with GRAMMY-nominated recording artist Justin Roberts. As resident artist of The Coterie Theatre in Kansas City, Missouri, Nolan has directed and choreographed world premieres by such Tony-nominated artists as Willy and Rob Reale, Stephen Schwartz, Stephen Flaherty and Lynn Ahrens, and Bill Russell and Henry Krieger. For Chicago Playworks he has directed The BFG, The Giver, The Witches, A Wrinkle in Time, Number the Stars, The Day John Henry Came to School, Peter Pan and Wendy and The Kid Who Ran for President. In March 2012, Ernie made his Off-Broadway debut as a choreographer with Lucky Duck at the New Victory Theatre. Nolan is currently the International Representative for TYA USA to ASSITEJ, a global theatre for young audiences service organization. With his appointment at NCT, he is leaving his position as Assistant Professor of Theatre Studies at The Theatre School. 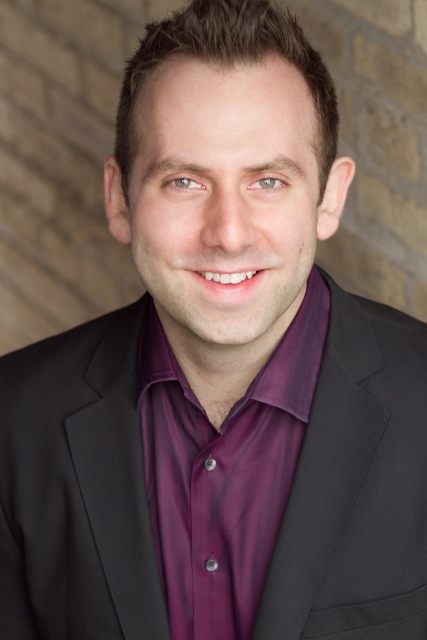 He is a graduate of both the University of Michigan Musical Theatre Program (BFA Musical Theatre) and The Theatre School at DePaul University (MFA Directing). The process of identifying a new artistic director for NCT began ten months ago. Frank Parsons, of the Center for Nonprofit Management, worked with NCT to conduct the search. 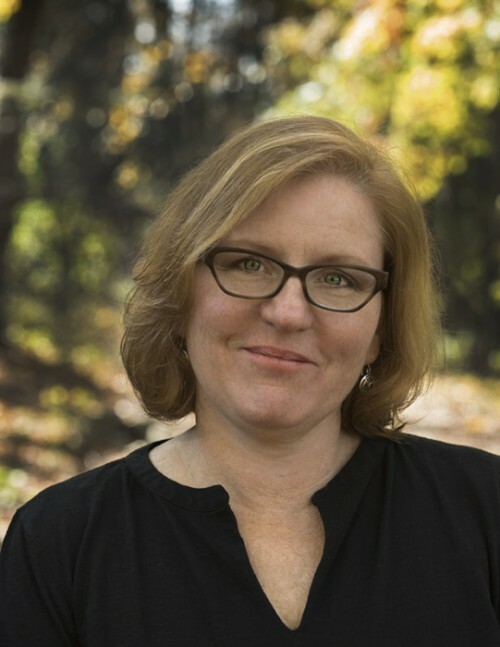 The NCT Board of Trustees approved Nolan’s appointment unanimously in late November. Nolan will visit the theater periodically over the next two months as he prepares for NCT’s 2017-2018 season, and will officially assume his post in February, 2017. Daniel Brewer, a longtime collaborator of Copeland’s at NCT, has served as interim artistic director since the latter’s death. About Nashville Children’s Theatre Nashville Children’s Theatre is a professional theatre company providing the children, families and educators of Middle Tennessee with extraordinary shared theatrical experiences that inspire imagination, develop creativity, and build community. NCT was founded in 1931 by the Junior League of Nashville and is recognized as the oldest professional children’s theater in the country. A national leader in professional theater arts and education programs for young people, NCT was ranked by TIME magazine as one of the top five children’s theaters in the country. This article has been pulled from BroadwayWorld.com. Based on the series by R.L. Stine, First Stage Associate Artistic Director John Maclay and Music Director-Composer Danny Abosch have adapted the novel into a musical which will charm audiences of all ages. The “big kids” will immediately recognize the storyline from Andrew Lloyd Webber’s The Phantom of the Opera while the “littler ones” easily pick up on all the Disney references. When Brooke and Zeke are cast in a show about a phantom, strange things begin to happen at the school. Is someone playing tricks? Or is there a real phantom out to stop this production? Director Niffer Clarke masterfully keeps the silly suspense turned up high amid the solid musical numbers and her own well-executed choreography. With Stine’s books, it’s the kids who are the smart ones and Brooke and Zeke certainly rule here as they try to figure out who—or what—is actually behind all the ominous warnings. The Chills cast of young performers handled the acting chores at last Saturday’s matinée with the utmost enthusiasm and professionalism. Chantae Miller is already a veteran of local productions and it shows in her pitch-perfect performance as Brooke. Jake Koch’s Zeke is the perfect comic foil and Mallorey Wallace hits all the rights notes (literally) as “mean girl—kinda-sorta” Tina. Veteran stage actors Carrie Hitchcock and Chris Klopatek serve this production well as the befuddled teacher and scary janitor, respectively. Read the full article by Harry Cherkinian from the Shepherd Express here. 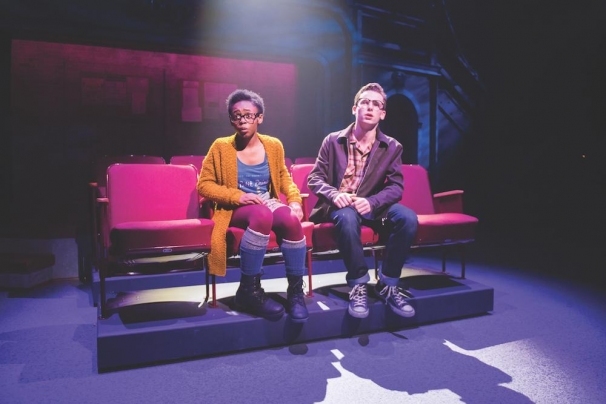 It’s not always the case that a play lives up to either its title or its billing, but First Stage, as you might expect, does just that with “Goosebumps,” which opened over the weekend. The full title of the play is “Goosebumps: Phantom of the Auditorium: The Musical,” based on a book by R. L. Stine, who wrote a series of novels for children that have sold over 30 million copies worldwide. The musical was yet another world premiere for First Stage and was written by John Maclay, who wrote the book, and Danny Abosch, both clients of the Gurman Agency, who wrote the music. The two combined to write some of the best and most interesting lyrics I’ve heard in a long time. A high school drama class is going to stage a play under the thoughtful and hopeful direction of Mrs. Walker (a marvelously disguised Carrie Hitchcock). The story of the play is about a phantom who prowls the halls of the school auditorium. There are eight students (in the Chill cast which I saw Saturday) who have various roles in the production, headlined by Brooke Rodgers (Chantae Miller) and Zeke Matthews (Jake Koch) who is really the phantom. Goosebumps runs through Nov. 13. Read the full article by Dave Begel from OnMiluakee here. 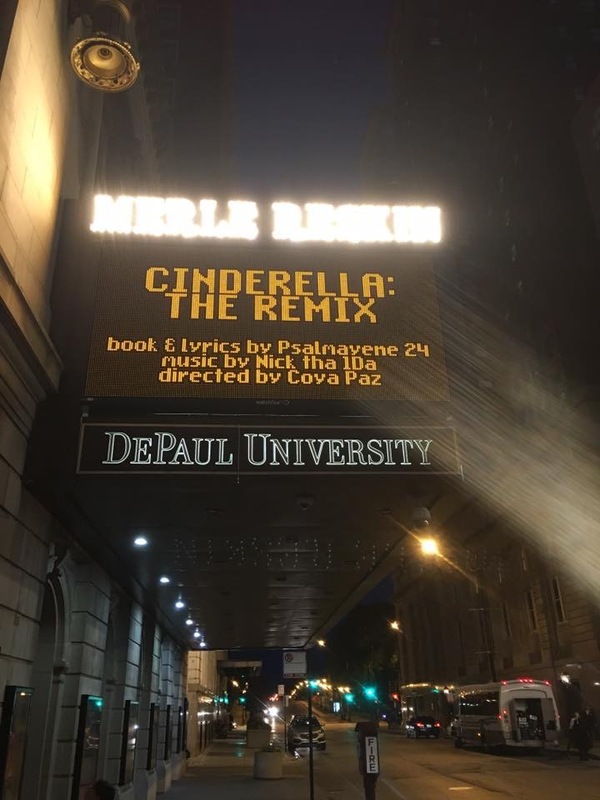 CINDERELLA: THE REMIX, book and lyrics by Psalmayene 24, and music by Nick tha 1Da premiered last week at DePaul University in Chicago, IL. MOCKINGBIRD, adapted by Julie Jensen from the book by Kathryn Erskine, has been nominated for two Helen Hayes Awards. One for Outstanding Original Play or Musical Adaptation, and one for Outstanding Production, Theatre for Young Audiences. 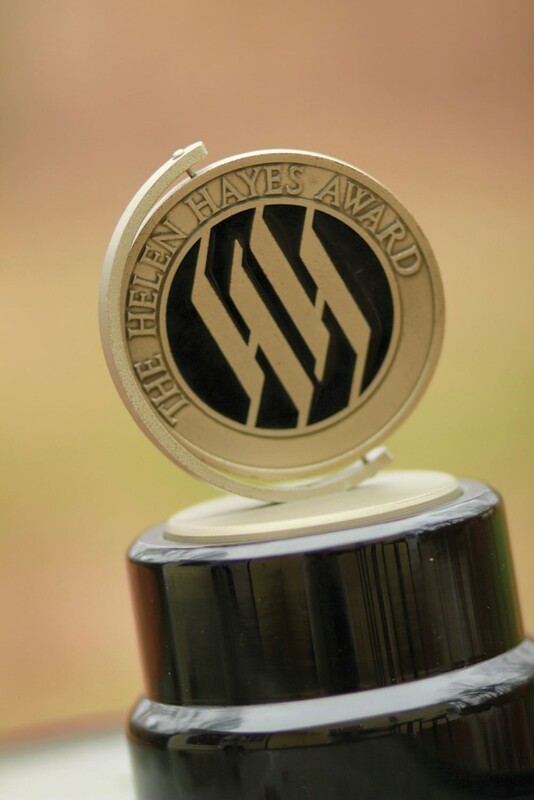 See the full list of nominees here. If you were in school for theater, what made you write a play? I wasn’t being cast in the plays they were doing, which were restoration comedies and I had a thick New York accent and a lisp and something of an attitude. Plus, I’d never even seen a play before I went to college. I came from this big dysfunctional Irish American family and my uncle was an actor, and it seemed like an exotic life so I kind of latched onto that. I lived in New York City; you’d think we would have gone to plays. My mother was a Girl Scout leader, and we went to the Statue of Liberty and Central Park, but not plays. Read the full interview from Donna Hoke’s blog here.